Losing your home is one of the most traumatic experiences a person can go through. There are memories floating in every nook and cranny and sentiment attached to every photo or precious item. Unfortunately, the wild beast of nature pays little regard for human sentimentality. One kiss of death from a raging wildfire, a torrent of flood water, or a catastrophic hurricane, can bring our box of memories quite literally crashing down. Claims adjusters face the full brunt of this devastation - and what a busy six months they’ve had in the US dealing with natural catastrophe after natural catastrophe. But every now and again, a “true story of claims heroism” brings light to the dark sphere of loss adjusting. Andy Brotherton is a general adjuster at member-owned PURE Insurance, based out of southern California. When the Napa, Sonoma wildfires started in October last year, he went straight to the danger zone to assist PURE members with claims. “The first claim I received came from a member whose property was located in the hill above Santa Rosa, which was an area of grave concern with the wildfires. The unfortunate reality was that her house was probably going to be destroyed,” Brotherton told Insurance Business. 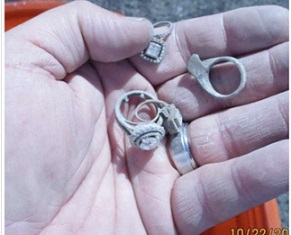 It would have been easy for Brotherton to tell the member there was little hope of finding a few precious rings and earrings amid the rubble of her devastated home. But that would have contradicted the PURE Insurance principals of “thinking outside the box” and doing everything possible to “delight the membership,” he explained. As soon as safety allowed, Brotherton drove the member to her rubble-reduced home with the primary goal of locating the lost jewelry items. He took to the needle-in-a-haystack task of filing through the damages with the hope he could make a difference to a woman who had lost nearly everything. “After about 45 minutes of hard work and determination, I happened to move a roof tile and spotted a bracelet. Unfortunately, it wasn’t one of the sentimental pieces, but the member said the rest of the jewelry should be in the same area. I spent the next three hours on my hands and knees digging through about two-feet of rubble, which kind of felt like digging through a Lego box looking for that one little Lego piece you desperately need,” he said. “Andy’s story is special because of how remarkable it was to retrieve those tiny [but hugely sentimental] items in the face of such tragedy and devastation,” he added. Will the California wildfires result in a mass insurer exodus?